There's plenty to like, but still the FS, in acoustic or electro formats, is a missed opportunity. ...cramped bridge spacing, rather piezo-y plugged in voice and 'small-handed, beginner's' aim. A problem for most makers in these crowded times is quite simply, how do we sell more? When approaching the half century of the venerable low-end acoustic champion, the FG, Yamaha had a different problem: how to refresh something that, in sales terms, really isn't broke? Using "proprietary software created to analyse and simulate the tonal characteristics of musical instruments", Yamaha's boffins redesigned the 700 series to create more "volume, a little more bass, a little more oomph". For the new 800 range, Yamaha boasts: scalloped bracing that "moves the resonant centre much closer to the middle of the guitar", a 0.25mm-thin finish for "great tone and superior wood protection", and "a thin back and sides construction" to ensure maximum volume and resonance. The 800 series centres on just two body shapes: the original dreadnought FG and its smaller FS sibling. All models have solid spruce tops with a choice of laminate back and sides: nato/okume (800), mahogany (820), rosewood (830) and flamed maple (840, FG only). The 850 models have solid mahogany tops with laminate mahogany back and sides. Cutaway electro 'X' models are available in the 800, 820 and 830 levels and to cater for the niches - we get one left-hander and one 12-string (both acoustic in the 820 level). The FS is a comfortable seated player with a slightly down-sized sound in comparison to the FG series. is a little unevenly cut in places, but the gloss finish is clearly very thin - the ripples of the grain clearly visible. There is also deep chocolate brown of the laminated rosewood back and sides and neat details such as the cream plastic heel cap, the round-nosed heel shaping, the clean abalone-centred soundhole decoration, and the clean headstock logo and fleur motifs. A peek inside reveals equally tidy construction. The very slightly flat-backed oval fingerboard is rosewood. Fretting is from a small gauge; it's very cleanly installed with the ends sitting over the binding, but the fret top could do with a better final polish as it's a little scratchy on bent notes. While the electro FSX has a screwed-in metal strap button/output jack at its base with no nuts to come loose, it doesn't have a second strap button on the heel, which seems an oversight for strapped-on stage use. The electronics have changed, too: the ART one-way pickup changes to the under-saddle from the SRT (Studio Response Technology) system. The efficient-looking preamp offers rotary controls for volume, bass, mid and treble - each EQ is centre-notched and can be cut or boosted as you'd expect - while a slider operates the AMF (Adjustable Midrange Frequency) control, which offers a very wide range between 80 and 10kHz. The onboard tuner doesn't mute the output when engaged (we've moaned about this before! ), and while there's a battery status LED, there's no phase switch or notch filter. The FS is unique within the Yamaha range with its shorter scale length of 635mm (25 inches) compared with the longer, Yamaha-standard 650mm (25.6 inches) of the FG. "Its short scale makes it an excellent choice for guitarists with small hands," reckons Yamaha. Nut widths are the same as Yamaha's FG guitars, but the bridge spacing on the FS closes from the FG's 55mm to 50mm. In addition, the reduced body depth of the FS is "for improved playability, especially for beginners", says Yamaha. So, we have a £536 guitar intended for small-handed beginners? Really? Yamaha seems to have overlooked Martin's industry-standard 'short' 632.5mm (24.9-inch) scale used on thousands of 00 and 000s, for example, that is hardly aimed at small-handed beginners. And the cramped string spacing is at odds with the small-body, fingerstyle genre. Odd. The FS is a comfortable seated player with a slightly down-sized sound in comparison to the FG series, too. It has the FG's clarity and modernism, but is a little more controlled with a good balance across the frequencies. It doesn't have the power of its bigger-bodied sibling, but that could be an advantage plugged in. is typically well sorted with quite a piezo-y tonality (it's hardly alone there! ), but very well centred EQs and a hugely viable midrange. Nasally upper-mid peaks can be attenuated, or muddy lows cleaned up, while the treble and bass controls can be used as a more general EQ. The FS's cramped bridge spacing might be an issue for some fingerstyle players, but it's less of a problem for more general styles: playing with a pick as you might in some acoustic versions of your electric set, the spacing and scale all 'fits', and it's this FS that gets the most playing time by quite a margin. 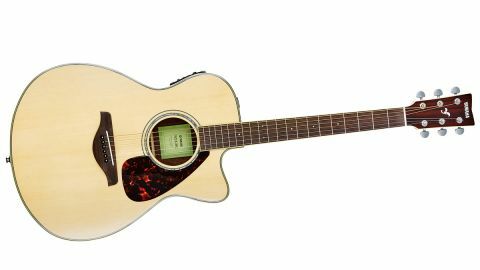 It's not perfect, but the acoustic FS is damn close in terms of build with a cleaner dread-style tonality that would suit virtually any player, and it'd be money very well spent.However, whether we'd go for the electro cutaway, or the non-cut acoustic model that's £176 cheaper at full retail, is open to debate. Plugged in, it's good but a little piezo-y, and there's no tuner mute. When we put on an LR Baggs M-1 Active soundhole pickup (around the same cost as the acoustic/ electro price difference), the FS sounded superb; likewise, a quick mic'd recording produced excellent results. However, that bridge spacing might just be too tight for a serious fingerstyle player and it seems a major oversight on the FS, as does putting the short scale length into the beginner's category when slightly shorter scales are standard on both Martin and Taylor, not to mention electric brands such as Gibson and PRS.